(Newser) – Were cadets raising their fists to sisterhood, Beyonce, Black Lives Matter—or just taking pride in their pending graduation? 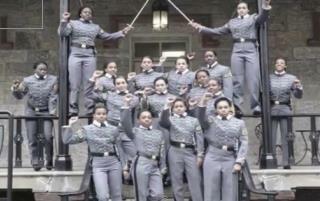 A photo of 16 black female cadets raising their fists in traditional military dress at West Point was posted online in April, sparking debate and spurring the military academy to investigate, CBS News reports. Some say the cadets are clearly allying with Black Lives Matter and breaking an Army rule against political activities in uniform. The photo is "completely unprofessional," writes Iraq veteran and blogger John Burk in a post that's gotten some attention on Facebook. He adds that Black Lives Matter is "known for inflicting violent protest throughout various parts of the United States, calling for the deaths of police officers, and even going so far as to call for the deaths of white Americans." Race should not be a factor at WP. These cadets should all be thrown out. There should be no room for a flagrant black fist posing photo. A lousy impression of supposed military officers. Real scum.